The reasons for pessimism are legion. China’s economy has already seen its annual growth rate fall from 12% in 2010 to 7% in 2013. When the crash comes, it will not be a gradual downturn. It will be sudden. And it will stick around. In this view China’s undoing rests on multiple missteps. China’s local governments and state-controlled banks have over-extended credit. The resulting debt-fuelled bubble in asset and real estate prices will surely burst, revealing large hidden non-performing loans. China boosted its economic growth through “unlimited supplies of labour”. (This phrasing was Arthur Lewis’s evocative description of a developing country’s large reserves of low-wage labour.) But no country’s labour reserves are truly unlimited. So when an economy hits its “Lewis turning point”, when labour reserves fall sufficiently that wages start to rise, low wage-reliant economic growth will sputter. Early on, China reduced risk of imminent mass famine and deep poverty by its one-child policy. This slowed population growth and permitted an economic surplus that could be saved and invested. But that policy has also resulted in a rapidly ageing population, so that economic growth is now threatened both from having so many old and unproductive, and from shedding the demographic dividend (where an economy enjoys a growth boost through having many young, energetic workers). But not just in its one-child policy does China err for the long run through actions thought beneficial in the short term. China’s investment rate of 50% of GDP boosts economic growth short-term, but piles up excess capacity longer-term. China’s export prowess drives economic growth short-term but exposes China to greater risk from international downturns, longer-term. Finally, these last three decades China’s command-and-control approach to allocating resources might have successfully guided economic growth. But, in the eyes of critics, that system has also ended up generating steep inequality in opportunity and outcome, so that now the threat of social instability is kept in check only through ever-higher economic growth churning out jobs for China’s people. The case for a crash in China’s economy does not argue that what is now in progress is a gradual slowdown (in the sense of, say, poor but fast-growing economies slowing as they move towards parity with the rich economies). Instead, the phrasing says exactly what it intends, a crash is imminent. China will be caught and held, bumping up against the ceiling of a Middle Income Trap that it cannot escape. How compelling is the evidence? But is the evidential basis for a crash in China’s economy definitive? Banking and financial problems are intricate. Just as many observers found difficult to read, ahead of the 2008 Global Financial Crisis, related problems even in advanced economies, even more difficult it is to assess China’s true financial position. Nonetheless, the weight of evidence appears to support the pessimistic view, that an imminent crash is increasingly likely. The case for China’s crash, however, is based not on finance alone, but on real-side considerations. On these latter fronts, evidence is mixed. China still has 100mn people living on less than US$1 a day, mostly in the relatively under-developed west. If China’s east coast manufacturing belt now sees rising wages and escalating costs, and pollution and congestion, China’s west in contrast remains massively under-developed. Averaging east and west, China’s per capita income today remains lower than that of nine countries in Africa. Since Beijing, Shanghai, and other parts of the east coast manufacturing belt have better than world middle-class incomes, it is simple arithmetic to deduce that wages in the west remain profoundly low, covering a workforce about as large as that in all of the US or the European Union. To integrate China’s western workforce into the national or indeed the global economy does not require physically transplanting those workers into China’s east coast factories and urban cities. It suffices that the output that workforce produces can be easily sold elsewhere in China. For that, China’s transportation infrastructure needs to be improved and extended. China needs more government investment, not less. That investment needs to be in infrastructure public goods, an undertaking that private enterprise hardly ever does well. In the US, the continental economy is joined together by an interstate highway system. This came about through hard-fought Federal and Presidential action, in a sequence of Federal-Aid Highway Acts from 1938 until as late as 1956. In that time many US lawmakers objected to these plans for their unproductively enlarging the role of the federal government. Only by the 1970s did the US, through extended deliberate government policy, come to have the adequate transportation network that it now enjoys. “The interstate system, and the Federal-State partnership that built it, changed the face of America.” China needs the same. Today, China’s infrastructure remains dismally below that in high-income economies. Its road network is 60% the length of that in the US. Its public airports number 10% that in the US. Despite China’s greater reliance on and the US’s disinterest in rail as a means of transportation, China’s train network today has just 40% the length of the US’s. For all the worries about over-stretched, misdirected finance putting up apartment buildings that then remain empty, China’s residential property per capita today has floor area less than two-fifths that in the US. Inappropriate investment will always be harmful regardless where it occurs, whether in China or anywhere else in the world. But overall does China over-invest? Does China’s investment rate of 50% of GDP indicate, by itself, inappropriate investment resulting in excess capacity? No. In its export-oriented growth trajectory, China follows many emerging economies that correctly reckoned their internal markets insufficient in size, and thus sought economies of scale by providing for the global marketplace. It might seem peculiar to call inadequate a domestic population in China that numbers over a billion. But marketsize is measured in purchasing power, not number of consumers. Empirical evidence shows it is in rich urban cities where China’s consumption grows most strongly: in Tier 1 cities, increases in consumption outpace even historical growth in national GDP. Therefore, making China a more integrated economy by reducing the inequality in development across east and west will automatically raise domestic demand overall and reduce China’s reliance on the vagaries of international markets. Thus, it could be self-defeating to seek to force China to reduce its export orientation. This would turn China towards less dynamic sources of economic growth and make China poorer. That, in turn, would reduce domestic spending, making China then depend even more on exports subsequently. But won’t China grow old before it gets rich? If the demographic dividend effect is indeed operative, then China’s economic growth will slow because of its ageing population. Moreover, Chinese society will need to set aside resources to provide for these unproductive old. But if the Chinese population becomes dominated by old people who will not work, then the economy will also need to generate fewer jobs. It is a strange thing to worry about old people being unproductive because they won’t work and, simultaneously, to fear that social instability will gush forth because an insufficient number of jobs is being created. There are certainly parts of the world that will have more young in the future than they do today, but which will be the more successful economy in 2030? One where 340 million old Chinese peacefully practise taiji in the park; or another where 100 million angry young Arab men take to the streets, unable to find gainful employment? It would be useful, to assess the likelihood of China’s imminent crash, to have rigorous studies that evaluate all these considerations jointly, and in sufficient numerical detail so that the necessary tradeoffs can be explicitly weighed, one against the other. Absent such an investigation, however, looking at the empirical evidence as I have just done fails to convince that China’s economy must crash soon. However, studies are available that measure increased statistical likelihood of a sudden permanent slowdown once developing economies reach a certain level of per capita GDP, regardless of the fine details in the structure of those economies. This “Middle Income Trap” might catch China. 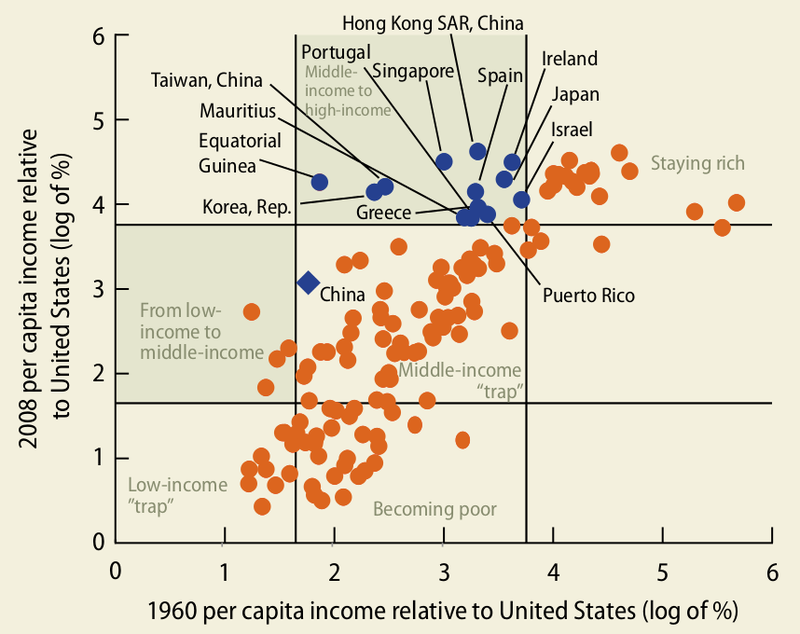 Among the most influential of such studies is that by The World Bank and the Development Research Center of China’s State Council, where a simple chart makes the key point: Who has been trapped at a Middle Income level, and who hasn’t? In this chart each dot is an economy. Economies that have succeeded appear in the upper part of the picture; those that have failed, in the lower. In the chart the 45-degree line through the origin shows economies that by 2008 were only in the same position relative to the US as they had been in 1960. Thus, although those economies grew, they did so only at the same pace as the lead economy; they failed to improve from their initial position. Economies appearing below the 45-degree line did worse — they fell further behind even when starting out relatively poor. The World Bank report argues that if one divides up relative incomes, not unreasonably, into groups of low, middle, and high, then by 2008 only 13 economies had broken out of the Middle Income Trap. The remaining 88 were trapped. Four varied economies: Equatorial Guinea, Israel, Mauritius, Puerto Rico. For policy-makers seeking to learn from the Middle Income Trap’s escapees, Group 2, the collection of PIGS economies, is almost surely not where one would go. Those economies had grown through unsustainable credit or debt expansion; they are hardly examples of economic success. Group 3 is varied: US economics and politics figure prominently for Israel and Puerto Rico, but not for the other two, both just small African states. This leaves only Group 1. These five economies all share characteristics in common with China today. They are all East Asian with a strong Confucian tradition. They are all high-saving economies. They have all grown through export-oriented development, emphasizing manufacturing. None has comparative advantage in natural resources. They all see significant government intervention in their development process. None is what the West would consider a politically successful liberal democracy. They all, early on, leveraged China’s large, disciplined workforce through foreign direct investment, employment, and engagement with specific geographical parts of China. And, these last are, by definition, what China does. The hypothesis that China’s economy will imminently come to a crash is a powerful, persuasively argued proposition. But empirical evidence fails to support that unanimity of vision. China’s economy might indeed crash. Then again, it might not. China’s economy has already surprised its many detractors for three decades. Will this time be different?